Now, you can add your name to your charm bracelet. Shown here, is a gorgeous script, complete with twirls and a star. This script is precisely etched, using a high-resolution laser, to show its remarkable detailing. 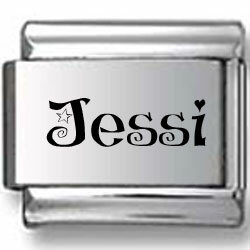 This Custom Name Laser Charm is crafted by a high-grade stainless steel base link, giving you an engaging and memorable piece.